Okay, it’s been awhile and I am sure everyone has been sitting in suspense waiting for this. I had written most of this [and my next] post back around the time of the race, but since the race, I have had a week of intense training at the new job and then the first week with the students. Anyone who has taught before knows this is certainly no easy task and very, very time consuming. Thus, these posts have kind of fallen to the bottom of my list of things to do. We left off with me climbing the stairs out of the Ohio river after swimming 2.4 miles. I was excited to be exiting the water. 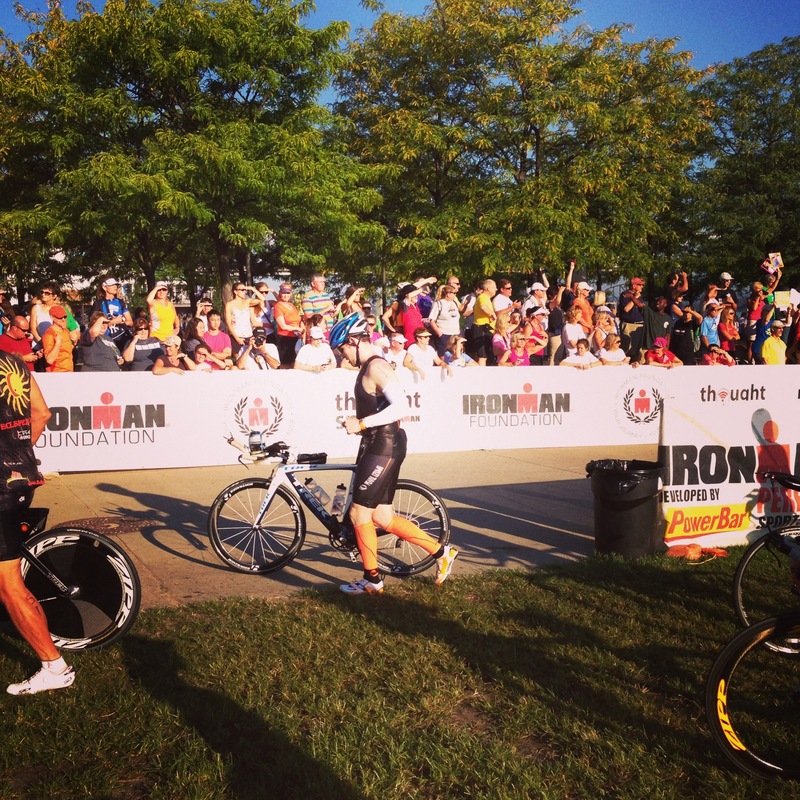 One main thought quickly crossed my mind as I was making my way to the transition area, “Okay Paul, you can’t drown anymore.” I had been at the expo on Friday and Saturday and overheard one man explaining his take on the race. He breaks it into three pieces and thinks “Once the swim is over, you can’t drown anymore. Once you finish the bike, you can’t crash anymore. Once you finish the run, you are an Ironman!” I laughed at the time, but looking back I really liked that way of thinking. I ran up the chute to the transition area started yelling my number and had the volunteers help me find my swim to bike bag. I had never done an ironman before, and let me tell you, time flies in transition. 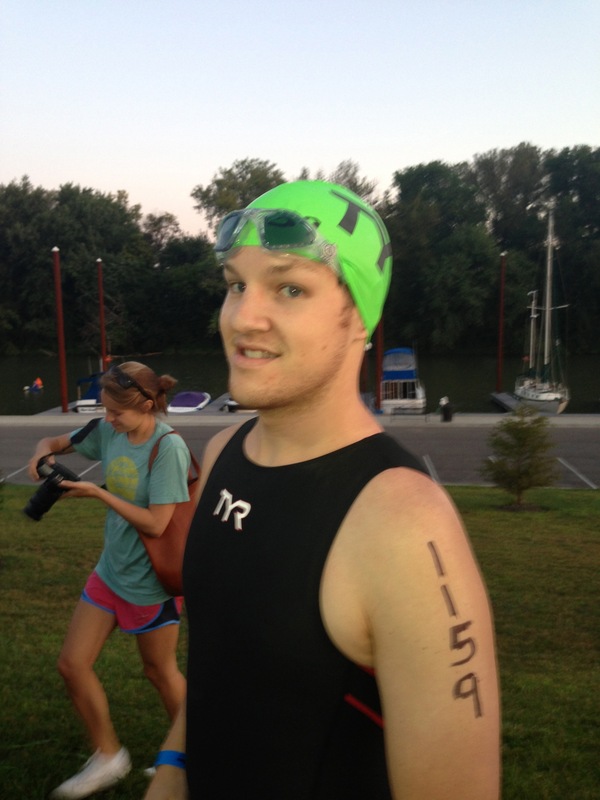 I had worn my tri kit under my TYR Torque swim skin so I didn’t have to change that at all, but due to the wetsuit optional swim, I wasn’t able to wear my compression sleeves or arm coolers in the water. I did my best to dry off before trying to pull them on, but it still was nearly impossible and took what seemed like forever. I finally got everything together, pulled my shoes on, strapped on my helmet, put on my sunglasses, spread some Chamois Butter in some important areas and headed out the other side. I had a volunteer throw some sunscreen on and grabbed a handful of vaseline which I would spread on the nose of my saddle to keep me moving comfortably on there. I was again directed toward where my bike was racked grabbed my bike and headed out. 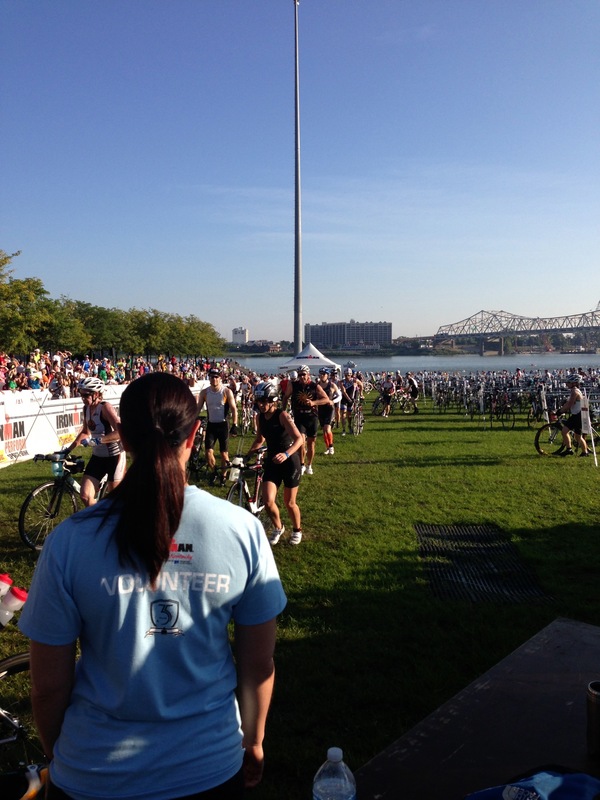 The bike course started heading out parallel to the ohio river. This section was beautifully shaded and I was feeling great. My plan for this ride was to ride as hard as I comfortably could. I knew before going into the day that my run leg was going to seriously suffer. My run training was garbage and I knew I didn’t have the fitness there to have a good run split. I knew however that no matter what I would be able to walk the entire course if I had to so I wasn’t worried about burning my legs out before going into the run. This course is described as rolling hills, and the first and last ten miles are probably accurate in that description. The rest of the course is not in my opinion rolling hills. Maybe rolling ‘climbs and descents’ but rolling hills does not do this course justice. Back to back riders would come to pretty long relatively steep hills followed by pretty long relatively steep descents. The uphills I probably averaged somewhere between 10 and 15 MPH depending on which hill it was, and the descents I was consistently hitting over 24-25 sometimes with gravity doing all of the work. The course is laid out pretty well though. You ride out of town about 18 Miles. Then there were about 10 miles out and back on a nice country road. This section was in my opinion one of the toughest sections of the course. Steep climbs and descents here, narrow road, and riders riding both sides of the road can lead to unsafe conditions. After this point, riders turned right again and rode just over a mile before turning right to enter the 30 mile loop which would be ridden twice during the course. Again there were tough hills and some fast descents. One thing that has been talked about a lot before the race was the fest in LaGrange and I have to say it was a lot of fun to ride through LaGrange. It gave everyone a boost of energy on the first loop and something to look forward to during the end of the first and beginning of the second. Tons of spectators and loud music; the riders were loving it. After the second loop, you were only about 20 miles away from the bike finish. This stretch has always been described as flat and fast in all of the reports I had read. I am going to say that this section is not as tough as the middle portion of this ride, but by no means is it flat or fast. Again if we are speaking comparatively with respect to the rest of the course, yeah then this section can be called flat and fast, but on its own not at all. I think it was at the 100 mile marker that I looked at my watch and saw it was around 2:30 pm. This was the first time the whole day that I knew I would finish the race. I teared up a little thinking about this, and kept on pedaling. The last turn of the course back into transition had about a one inch lip to hop up which after riding 112 miles is not as easy as you’d think. I slipped my feet out of my shoes but didnt do a flying dismount. I simply wanted my shoes to be left attached to my bike so I didnt have to awkwardly run in bike shoes to the changing tent. It was about 3:15, and I knew I would have about eight and a half hours to complete the marathon run. Check back in the next few days to see exactly what happened on those 26.2 miles that officially capped my transformation from overweight and inactive to Ironman Finisher in just over 2 and a half years.